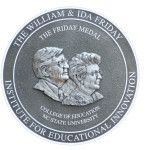 The Friday Institute for Educational Innovation at NC State University’s College of Education is pleased to announce that this year we are honoring Innovative Superintendents of North Carolina Rural Districts with the 2017 Friday Medal. In collaboration with the NC School Superintendents Association we have selected the following seven superintendents to each receive the award, which we will present to them both for their own accomplishments in improving student learning and implementing digital-age approaches to teaching and learning, and as representatives of the many other dedicated and innovative rural superintendents who serve the students of the State. • Hon. James B. Hunt, Jr; Former Governor of North CarolinaThis award is given annually to those who embody the mission and spirit of the Friday Institute. The 2017 Friday Medal ceremony will take place on November 15, 2017 at the Friday Institute for Educational Innovation. Click here to learn more about the award and to view past recipients.